Daisy Delight Minaudiere foundation fabric is a whimsical floral 100% cotton fabric called Flowers Aplenty by Michael Miller. Discovering the Bow Tie Minaudiere shell kit made by Ellen Medlock Studio of Tulsa, OK, opened a new platform. 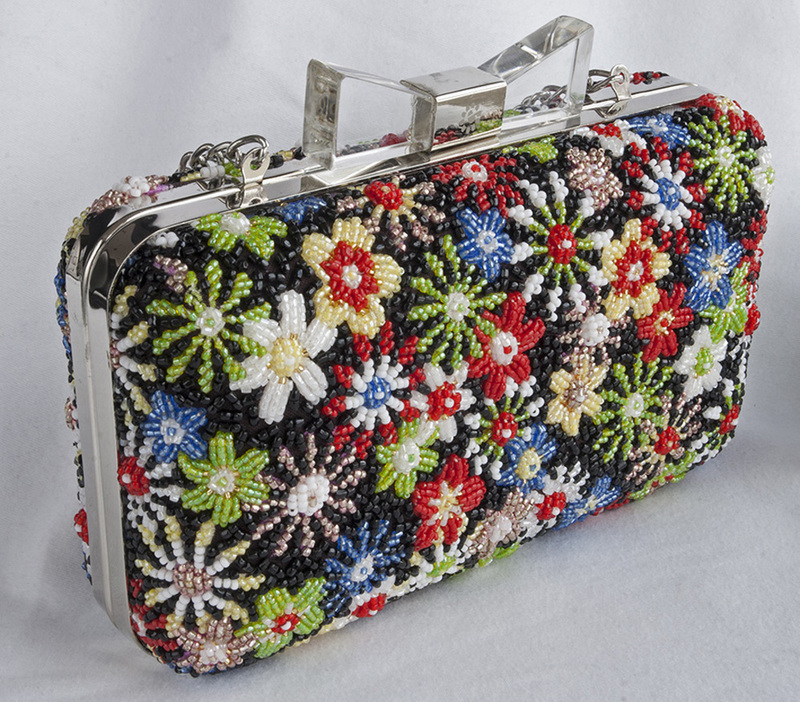 The challenge was to create a form-fitting pattern so the beadwork would fit like a glove over the purse shell. The flowers became 3-D using a variety of raised techniques. The mixture of diagonal and vertical lines on the flower petals created texture and movement amongst the petals. The beads used were a mixture of Tri-Cuts and Seed beads in a variety of amusing primary colors. The ‘seed stitch’ background using Tri-Cut black beads is known as Para in Japanese Bead Embroidery and ties the entire field of flowers together. Daisy was stitched on Evertite Stretcher bars in order to maintain the drum-like tightness necessary for this style of bead embroidery.